If you're looking for retro-vibed stack and don't want to part with too much cash, SubZero's offering is well worth a look. Great for vintage, indie, classic rock and rockabilly sounds. Impressively affordable. Metallers should look elsewhere for their sounds. Stacks have always been the loudest and proudest member of the amp family, but maybe not the most practical or cheap. That's why it's all the more surprising to find a credible, valve-powered head and accompanying cab at this price point - and not a shrimpy one either. The Tube-H50R contains a full 50 watts of loud, which is more than enough for most venues. Our interest piqued, we power up in hope that the SubZero Tube-H50R Head with 4x10 Celestion Speaker Cabinet tone is a little more charismatic than its name. Before we get to sounds, let's look at some basic specs. The H50R head is a single-channel design with twin inputs, one a little hotter than the other, that is built around a pair of 6L6 Ruby power valves. 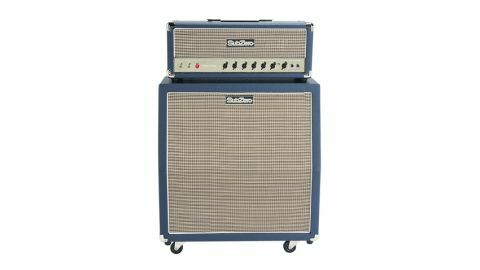 The valve complement suggests Fender-like American sounds, although the blue Tolex finish and retro grey grille cloth all say 'Brit Invasion'. Despite the vintage looks, there are some useful concessions to modernity: the amp is a master volume design, which means it has an independent gain control for dialing in the dirt. There's also a boost button that gives you access to more drive, should you need it, plus a presence control to add edge. There's even an effects loop. The most interesting feature, however, lies further south. The matching G410 cabinet, which comes fitted with handy castors, contains a quartet of 10-inch Celestion tube speakers. It's a refreshing change from the more usual 12-inch units, and harks back to classic amps such as the Fender '59 Bassman combo. Intrigued, we plug in a '57 reissue Strat to see what's cooking sonically. With gain at half way and a splash of the built-in spring reverb, we are greeted by warm, furry vintage crunch tones that break up nicely under strong pick attack: think Woodstock rather than Donington. Turning up the gain yields a fat but quite loose vintage overdrive tone that is tinged with speaker breakup. The boost button accentuates the amp's squashy side without bringing much extra punch to the party. No matter - things are fine without it. Dial down the gain and you get tweedy, Fender-style cleans, with just a hint of darker Brit tonality to keep things from becoming too clanky and spanky. Switching to a mini-humbucker equipped Chandler 555 brings out the amp's Marshall side - possibly aided by the ported, close-back cab. Early AC/DC riffs sound good and raw, if lacking the steel-tipped definition metallers crave. Assuming there's any Brit influence at all, here, it's far nearer the Marshall JTM 45 than the JCM 900. Clean or dirty, this is no hard-edged metal machine and is far more suited to the vintage-minded player. Overall, there's little to dislike about the H50R for the price. The finish and fit aren't luxury grade, but they're perfectly serviceable, and the modern looking badge on the speaker cloth does jar with the vintage image a bit, but these are small quibbles. We would say, however, that this amp would suit retro and indie players more than metallers. It'll do classic rock and rockabilly to a tee - the clean and crunch tones are really cool for those applications, but the amp's vintage sonic character won't do justice to tightly defined, slammin' power chords. As long as you don't need that, this is an impressively affordable way to get in on the ground floor of high-rise amplification.